Etiwanda baseball standout Matt Bardowell just wrapped up his freshman season but he already knows where he wants to play in college – USC. He made a verbal commitment to that school today. He says is twas his dream school all along so he didn’t need to wait to see what other offers night roll in. Bardowell started this season as a freshman, hitting .381 with 20 RBI, 21 runs scored, five doubles, two triples and four home runs. On the mound he went 2-1 with a 2.74 ERA in six appearances. He plans to pursue dental school ,which also factored into his decision. Another one has been bestowed on Etiwanda senior shortstop Tyler Freeman. Freeman has been named to he ABCA/Rawlings All-American team, one of just 13 players chosen nationwide to the first team. He hit .526 with 35 runs scored, 36 RBI, eight doubles, four triples, four home runs and 18 stolen bases. His on-base percentage was a robust .638 and his slugging percentage .814 in leading the Eagles (27-3) to their first CIF championship. His consistency was also impressive, as evidenced by the fact he got at least one hit in 28 of 30 games and recorded multiple hits in 17 games with a best of five coming against Chino Hills in a regulation game. He struck out just six times all season. Freeman has signed with Texas Christian but was drafted in the second round by the Cleveland Indians earlier this month so he’s weighing the decision of going to college or pursuing professional baseball. Here is the link to Rawlings release with list of players honored. Several other teams winning CIF titles will also be saluted. The Eagles (27-3) finished off a storybook season by beating Palm Desert 2-1 for their first CIF Southern Section title, this coming in a very competitive Division 2. Coach Don Furnald’s team started the season 1-2, then won 26 of the next 27 games, the lone loss in that stretch coming in Baseline League play to Los Osos 3-2. Two of the team’s three losses were by a run. “It will be a lot of fun for our kids, something they will always remember,” he said. 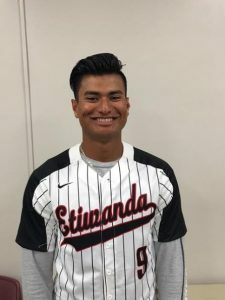 Etiwanda High School pitcher Marcus Johnson is just a sophomore but he already has his mind made up when it comes to college. He is committed to Duke. It came down to athletics and academics. He plans to major in mathematics. Johnson took an unofficial visit to the school in February. He also visited Pepperdine and was talking to other NCAA Divsion I’s in Virginia and Oregon State. He didn’t see the need to wait and longer to see if other offers would come along. Johnson has been a key factor in Etiwanda’s run to a Baseline League title. He is 7-2 with a 1.87 ERA in 10 starts (52 1/3 innings). The Eagles (22-3) have completed the regular season and start playoff action next week. It has been quite a week for Etwianda baseball standout Steven Rivas. On Monday he was named the Daily Bulletin Male Athlete of Week, then he won the on-line voting as overall So Cal Prep Legends Athlete of Week. He topped that off over the weekend by committing to Long Beach State. It was the only school he visited but other such as Division I Texas Christian, Hawaii and San Jose State as well as local Division II powers Cal Baptist and Cal Poly Pomona were also interested. There is another bonus that goes with that commitment. Teammate Chris Jimenez will also be going there. Rivas has helped the Eagles to an 9-2 record thus far. He is hitting .575 with 13 RBI, five doubles, two triples and two home runs. 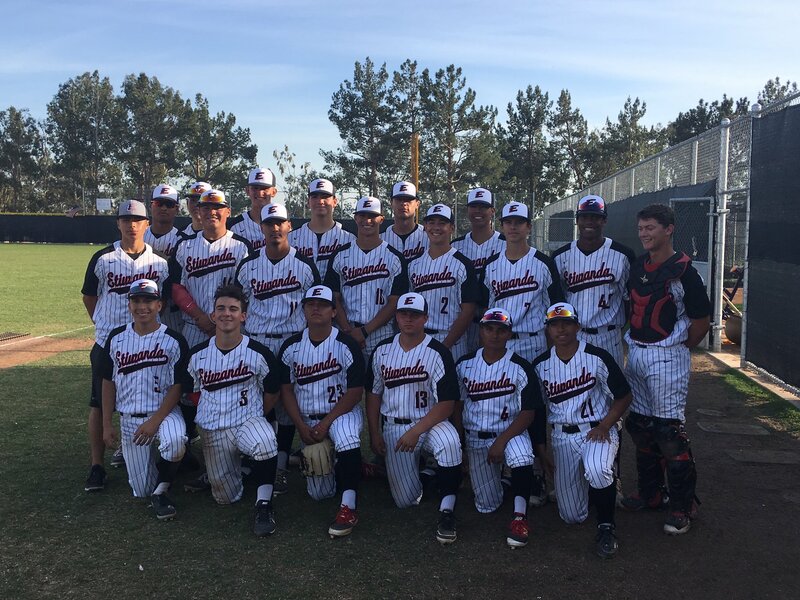 The Etiwanda baseball team collected 17 hits and cruised to a 15-2 victory over Chaffey in the championship game of the Cougar Classic on Friday at Rancho Cucamonga High School. Etiwanda (8-2) outscored its five opponents in the event 87-10. The beneficiary of the last offensive outburst was starting pitcher Marcus Johnson, who went four scoreless innings, giving up just one hit. He won two games in the tournament. 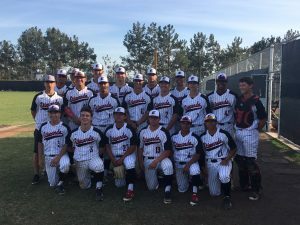 The outcome was hardly in doubt after Etiwanda pushed across three in the first inning, three in the second and five in the third to take a commanding 11-0 lead. Chaffey’s two runs came in the fifth inning. The Tigers (6-2) had a good tournament with quality wins over Carter and Rancho Cucamonga to get to the championship game. The loss of Freeman was the biggest disappointment in the stellar showing. Coach Don Furnald said his sophomore second baseman was hit in the face by an 87-mile per hour fastball in Thursday’s semifinal. He feared Freeman had broken his jaw. That was not the case but Freeman did need oral surgery. Furnald said he has no idea when Freeman will be able to return. Etiwanda High School pitcher Michael Berg will continue his education and play baseball at Trinity International, just outside of Chicago. Berg was 6-3 with a 2.31 ERA in 12 appearance (10 starts). He pitcher 76 innings and managed four complete games in helping the Eagles to a playoff berth. He was a first-team All-Baseline League and All-Inland Valley honorable mention selection. Berg was also considering Biola or going to Grand Canyon University and just focusing on academics. He plans to major in accounting. Berg hasn’t visited the school but has several friends that are going there so he has gotten a full scouting report on the school. He has another friend in Brady Lange, who just graduated from La Verne Lutheran, who will be going there as well and told the coach there about him. Trinity went 23-24-1 overall last season and 11-17-1 in the Chicagoland Collegiate Athletic Conference. Etiwanda High School shortstop Tyler Freeman has been chosen to participate in the Perfect Game All-American game to be held at 5 p.m. on Aug. 14 at Petco Park in San Diego. The event will be broadcast live by the MLB Network. Freeman, who has committed to Texas Christian, just rounded out his junior year with the Eagles. The repeat first-team All-Inland Valley selection hit .388 (33 for 85) with 29 runs scored, 17 RBIs, 11 doubles, 3 home runs and 13 stolen bases. Freeman was chosen based on his showing in Perfect Game sponsored events. He plays with the California Baseball Academy. He competed in a recent showcase in Florida and credits his performance in that for helping land him a spot. There has been no time off since the spring season ended for Freeman. He has a tryout for the Area Code games tomorrow at USC and will be headed to Arizona for another travel ball event later this month. Here is link to rosters of players chosen for the game. Etiwanda High School junior catcher Chris Jimenez got an offer he liked so he isn’t waiting. He has made a verbal commitment to Long Beach State. Jimenez made an unofficial visit to the school and also took trips to UC Riverside, Tennessee and Texas A&M. The fact that Long Beach is close to home and has a solid were bonuses. Jimenez helped the Eagles to a 19-7 record and 10-5 mark in the Baseline League which was good enough to tie for first place with Chino Hills. He hit .267 with 5 doubles, a home run and 18 runs and is also noted as a good defensive catcher. Jimenez plans to major in something business related. Athletic talent runs in the family as sister Julia has committed to Michigan for softball. Bailey Falter returned from a nearly one-month layoff and pitched the Chino Hills Huskies to a 4-3 win over Etiwanda on Saturday in the second game of the Battle of the Baseline at LoanMart Field. The win moved Chino Hills (15-8, 8-5) into a first-place tie with Etiwanda (16-6, 8-5), whom it beat for the second time in as many tries. The three games between the teams this season were decided by a total of four runs. Falter went the distance on the mound and struck out nine, including the side in the seventh. He gave up four hits, two of those coming in the third when Etiwanda manufactured two of its three runs. Jason Wallace stroked a towering home run to left for Etiwanda to tie it again in the sixth. That tie was short-lived as Chino Hills got the decisive run in the bottom of the frame on a bunt single by Just Chavez. VIDEO: Etiwanda’s Jason Wallace talks about his monster home run.